In 2017 both, small businesses and large commercial companies, proceed moving their projects and services to the Cloud in order to gain higher performance and receive in-house management within private installation. Choosing the most appropriate PaaS, companies aim to save their developers from routine tasks, whilst getting more automation to ensure faster time-to-market for projects, services, and applications with lower TCO. GMV innovative solutions has already made the step to the cloud, and today we`d like to share the detailed interview with Jesús Mariano Pascual Díaz from GMV, who is unveiling the key reasons and results of using Jelastic Private Cloud for more than two years. GMV is a privately owned technological business group with an international presence. Founded in 1984, GMV offers its solutions, services, and products in very diverse sectors: Aeronautics, Banking and Finances, Space, Defense, Health, Security, Transportation, Telecommunications, and Information Technology for Public Administration and large corporations. Our goal is to support our clients’ processes by dint of technologically advanced solutions, providing integrated systems, specialized products, and services covering the whole life cycle. These range from consultancy and engineering services up to the development of software and hardware, the integration of turnkey systems and operational backup. GMV is present in Europe, the USA, LATAM, and Asia, operating in different high-tech sectors, and has an extensive international customer base in all five continents. What cloud hosting solutions have you previously used? We previously used OpenStack in the category of on-premise solutions. Also, we used Amazon Web Services, Google Cloud Platform and Heroku for very specific projects. What were the key reasons to move to Jelastic? Now we are using some bare-metal servers (Intel platform) for both infrastructure and user hardware nodes. At least, for now, we have only Linux-based user nodes but we are planning to add new hardware in order to enable Windows support on our Jelastic platform. How have you set up your workload? Have you faced any problems with that? Since we adopted the on-premise approach the process was easy: a few authorizations and… Done! It’s nothing out of the ordinary. What were the results when you switched to Jelastic? We perceived a performance increase from the very beginning. Our developers gained greater autonomy during the lifecycle of our projects. The result was a higher efficiency and also the time to market shrank. The other on-premise alternatives mean constant effort, vigilance, and updating. We have increased the profitability through the cost cutting of operations and the reduction of the waiting time of developers. And definitely, automatic vertical scaling helps to save resources. Sure! An excellent service level and a team of highly-qualified professionals. One of the best support services we have ever seen before. Very good response time. It works fine. User-friendly interface. Learn fast. In line with our development strategy (continuous integration, DevOps, etc.). Continuous operation approach (Zero-Downtime update). Continuous improvement by means of updates (roadmap). Low maintenance requirements. Thank you for sharing your experience, Jesus! We hope you found this article useful. 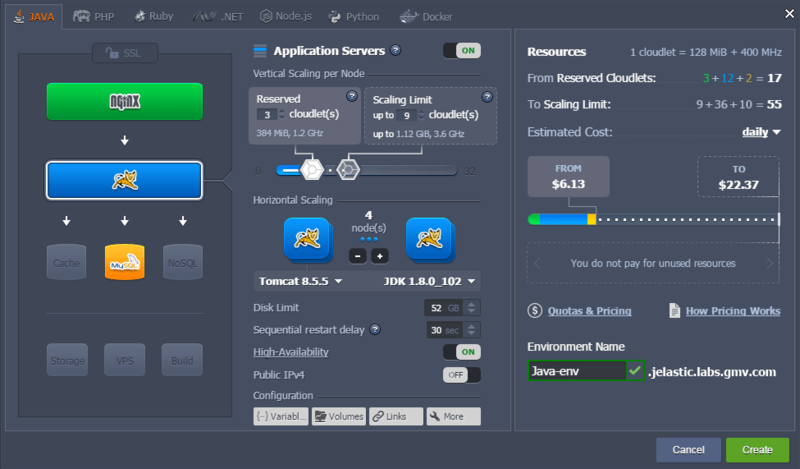 Do you want to see how Jelastic Private Cloud can level up your company by means of automated scalability, integrated CI/CD tools and zero downtime deployment with automated traffic distribution? Get more info about how to set up your own Jelastic private cloud. Subscribe to our newsletter to be in touch with our recent news and updates.